The girls of the Usakame High tennis club, Tanaka Kinako, Suzuki Ayako, Sato Kurumi, and Nishiarai-Taishi Nishi, pursue their various dreams... This high school comedy kind of thing starts now. Usakame, the official rival of the high intensity comedy Teekyuu, depicts the mostly ordinary but slightly strange daily lives of four girls who devote themselves to practice. All members of Earth Star Dream, an Earth Star Entertainment idol unit of nationally famous voice actors, appear in the show! Sit back, relax, and enjoy Teekyuu's rival Usakame. Usakame, for me, was one of the bigger disappointments of the past season. Coming off from Teekyuu especially, I was left astounded, confused, but mostly bored, and curious as to how boring this series ended up being. For the uninitiated, Usakame, like its sister series, is a short 3 minute anime centering around the straight man and her 3 other foils. However, decidedly different is how the two anime handle its pacing. Take a look at Teekyuu, it's fast and ruthless. Each second each moment the anime is on, the series spares absolutely no expense in having wasted. Jokes and gags get thrown at a ludicrous pace, and if it doesn't work, it moves on to the next scene. This rushed pace is what drew me into the series and is where Teekyuu draws its primary strength from. Neither the characters nor the jokes are particularly good or anything, but the frantic pacing and unorthodox direction makes it something really special. Now contrast that with Usakame. Despite having an additional minute, for whatever reason the pacing of the anime is decidedly slow. This works against the show's favor for good reason. Scenes get unnecessarily drawn out, jokes drag on and on, and by the end of the episode, nothing really happened. The slow pacing is the biggest flaw to Usakame, it can't decide whether it wants to be a 20 minute anime or a 3 minute short. Just watching it is tiring. And that's all I can say. It's tiring. Art 9/10: Great art! The way something's are drawn is similar to Hai to Gensou no Grimgar (Just connecting the art styles... not the anime in anyway.) I like this type of art style because it has texture, and it looks like well drawn storybook in a way. Sound 9/10: This is the only spot I may have a complaint for. The ost, opening, were fine, but the ending didn't hit me right. The huge saw wave synth you get as soon as you hear the end is nice, but it feels too overpowering for this series in my opinion. If it was slightly different, or tuned down a bit, I might like it 100%. Regardless, I like all the music, and that's the only thing that turned me off. Overall 9/10: This is a gem just like the rest of the Teekyuu series. For the rating this anime has at the time of writing this review (5.90), I think this is a very underated series. I would recommend any friend to watch it wholeheartedly. Reviews saying this show is Teekyu played at 50% speed are pretty much correct: the premise, the formula and even the characters are rather similar. 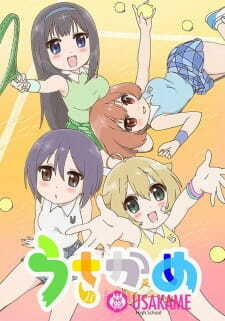 It follows the four girls from a rival tennis club of Usakame High School, that had a few appearances in Teekyu. Ayako Suzuki, the central character, plays the same role as Yuri, being the voice of reason in the group and actually being interested in the sport itself, while other girls are mostly goofing around (or participating in the club activities just to be near Ayako - there's a subtle yuri subtext to the main story-arc). The humour is of similar brand as in Teekyu, quite random and abstract, but its definitely slower (that's possible thanks to the 4 min episodes) and toned down (also when it goes to adult themes, which are almost absent here) - whether that's a negative is very much a matter of taste. I actually found this show very relaxing and much easier to follow, not as funny as the main series, but very much enjoyable in its own right. I also have to say that I liked the music (especially the opening song) and the art-style quite a lot. The animation is simplistic, but with its minimalistic style and pastel colours it feels like a sketchbook brought to life - a very nice artistic effect in my opinion. The voice acting sometimes falls flat, due to the cast not being professional seiyuu's (the show is pretty much a giant advert for Earth Star's idol unit and the girls from it voice the characters), but for the most part, it works fine. In summary, I was actually surprised by how enjoyable this show was, considering the below-mediocre reviews it gathers - it was different from Teekyu, but in a cute and mostly positive way. It's not even close as wacky and doesn't have many "laugh out loud" moments, but if you can get past that, you'll find a very nice and feel-good little series, definitely worth that hour of watching the whole 12-episode season takes to finish.